Enable auto-despeckle of images - when enabled this feature improves performance on images with digital noise and dithering. Enable auto-orientation – when enabled this feature allows the software to automatically rotate your documents. Manual rotation can be done if the user rights clicks on a thumbnail and uses one of the rotation options. Keep blank pages – when enabled the software will not automatically remove blank pages. Graphics clean up mode – with this feature enabled the software will automatically clean up handwriting and stamps. Disable the setting if it clears off parts of usable data from colour documents. Merge-mode – when enabled this feature allows the software to automatically rotate your documents. Manual rotation can be done if the user rights clicks on a thumbnail and uses one of the rotation options. 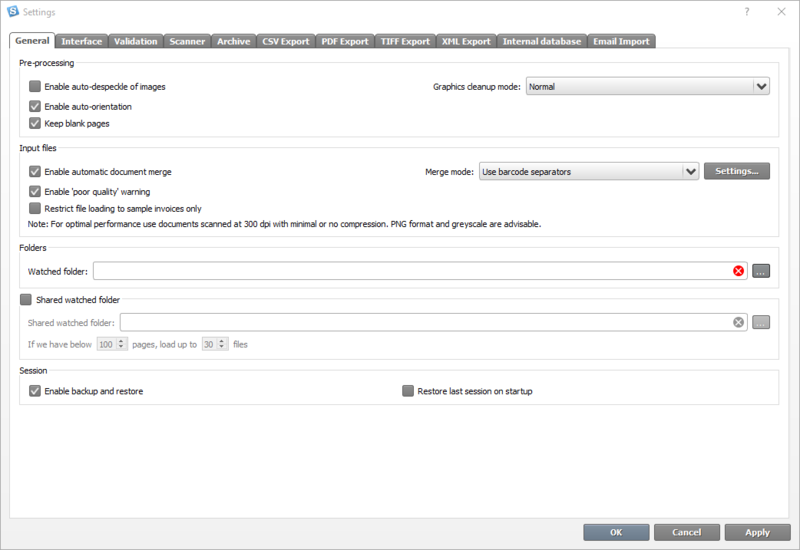 Enable backup and restore - enables the backup feature for documents that you have loaded in the current session. Restore last session on start-up - when enabled the software will restore your last session the next time you start it. Processed and validated documents will be kept so the user will not have to re-process them. If there were un-processed documents in the last session the software will ask the user if they want them processed.